And we’re about to make you smile. Syringa Property Management was formed by Dianne Hunt and two development partners, in July of 1989. Dianne began her real estate career in 1973 in sales and assisting with appraisals. She became active in the affordable housing industry in 1978 as an employee of a development/management company. Dianne has been active in the industry continuously since that time and has been an active participant in the development of much of the affordable housing in Idaho. Syringa was formed when the Low Income Tax Credit and other programs were relatively new; and has always had the goal of being the management company most knowledgeable in federal housing programs in order to provide excellent management fairly to it’s clients. Syringa has been retained by a variety of clients including non-profit organizations, full profit motivated owners, Native American Tribal Councils and the federal government. From it’s humble beginnings with a staff of one and a half (Dianne and a part time JTPA worker) with seven developments, Syringa has grown consistently to become one of the largest management firms of affordable housing in the Western United States. 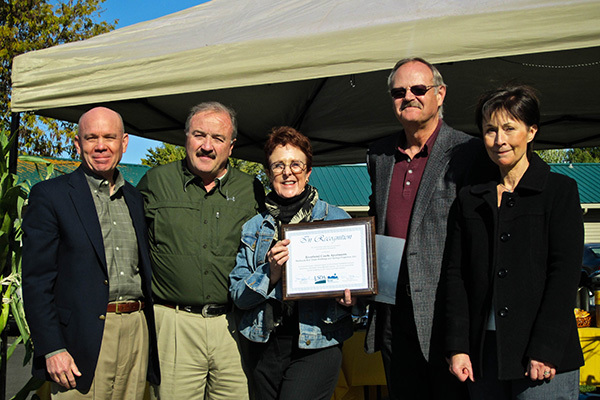 Founders, Dianne, Greg, and Gary receiving a USDA Rural Development award. Syringa Property Management, Inc. is a real estate management company committed to the service of our clients and our customers. It is the goal of Syringa to provide the best possible housing environment for our tenants while fulfilling the goals of the owners. HAVE YOU HEARD ABOUT THE SYRINGA ADVANTAGE?